PREbiotic – Prebiotics are the “non-digestible” parts of the food we eat, such as fiber. Prebiotics are a nondigestible food ingredient that promotes the growth of beneficial microorganisms in the intestines. So, what the heck is KOMBUCHA? It’s an effervescent fermented tea beverage that’s good for the gut – but it can be expensive if you purchase it pre-made bottled in stores. So, I decided to make my own. It is incredibly easy, and FUN! I got my Kombucha Brewing Kit HERE on Amazon. You could buy the supplies separately; but this made the most sense for me. You can get the SCOBY separately here too. 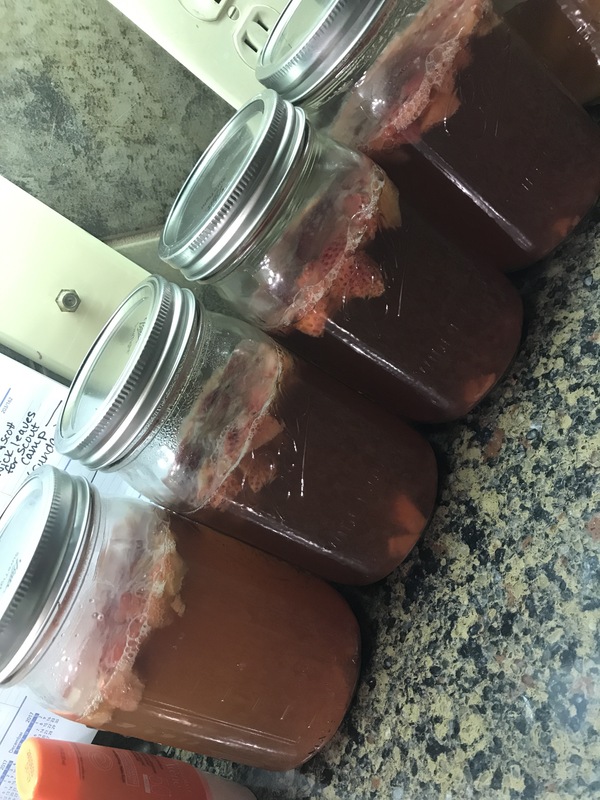 When I made mine, I simply followed the directions in the kit, which called for organic cane sugar, black tea, a thermometer, test strips and a SCOBY (symbiotic colony of bacteria and yeast). You’ll need to make sure your kombucha is at the proper ph level and temperature before adding the starter/SCOBY. Then, just pour into your jar, place in a warm location for 7-10 days and wait. Boil 2 quarts water on the stovetop. Remove from heat, stir in sugar until it dissolves. Steep tea bags in the sugar water for about 10 minutes. Let the water cool down to near-room temperature (under 80 degrees). If the water is too hot, it will kill the active bacteria in the scoby and your kombucha won’t ferment. Pour the sugar/tea water into the glass jar, and add the scoby and kombucha starter. Allow to process for 7-10 days. 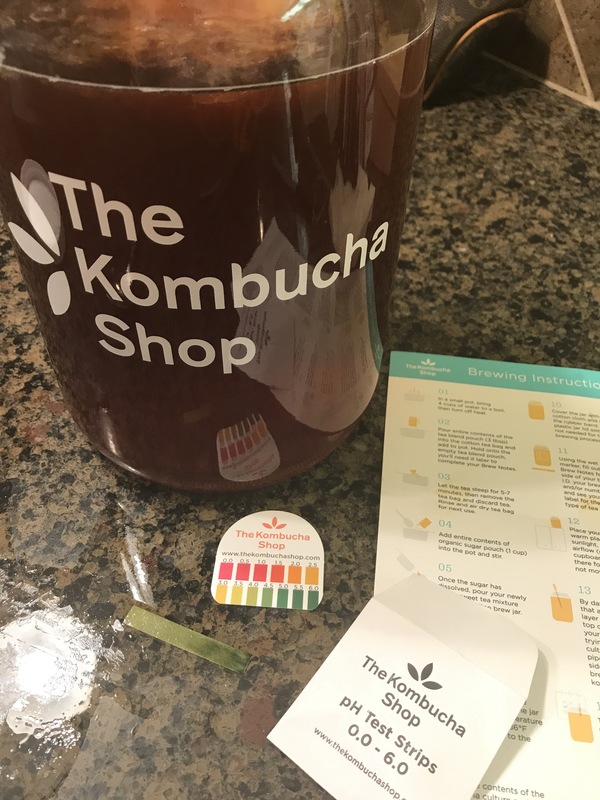 Test your kombucha after about 10 days to see if the “sugary” taste has gone away. 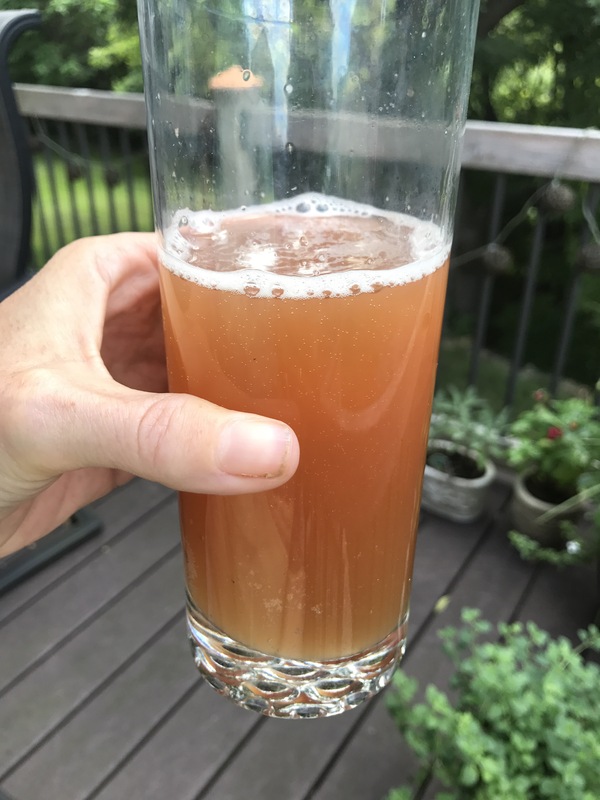 A kombucha that hasn’t processed long enough will still be very sweet. Next, start the second fermentation process. The second ferment is when you add flavor. Unlike the first ferment, it takes just a few days. 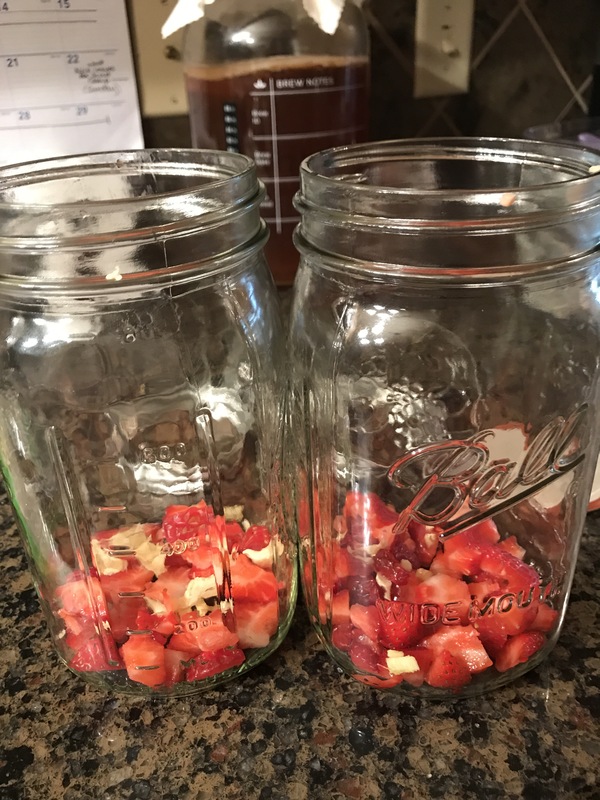 I did mine by adding strawberries, ginger and a squirt of lime juice and placed in quart size canning jars. You can also do apples and cinnamon – which is also delish! My friend warned me that sometimes these jars can build up pressure and the lids will need to be burped, but mine were fine without doing that. Now, I just leave the lids somewhat loose and out of reach so nobody knocks them over.